To keep up in a world where $1 of every $3 spent on health care goes to insurance companies for claims processing, primary care physicians must keep rosters of thousands of patients and book dozens of appointments a day. The result, overworked doctors and inadequate care, is something that Qliance Medical Group, a 26-person Seattle startup, is trying to cure. In late 2006, primary care physician Dr. Garrison Bliss and former Silicon Valley tech entrepreneur Norman Wu joined with former patient Chapin Henry to start Qliance, a primary care clinic that doesn't accept health insurance. Instead, patients buy care directly, paying a membership fee of either $39 to $79 a month or $59 to $129 a month, depending on what level of care they choose. The clinic is open seven days a week, and clients can make same-day appointments. Qliance also offers a variety of medical procedures like casting, suturing, and X-Rays; if a client needs further consultation for a complex issue, Qliance sends them to nearby specialists that it has partnered with to provide a discount on services such as MRIs. "The American Academy of Family Physicians says that adequate primary care addresses 90% of what people need to see doctors for," says Wu, who employs seven doctors and one nurse practitioner for roughly 2,000 patients. "We're trying to provide quality care to virtually all Americans regardless of income level, insurance status, or health status." Concierge medicine has been around for a long time, catering to affluent citizens who can afford to pay $1,000 and up a month for doctors that are always accessible. But Qliance is one of the first firms targeting a wider swath, including the working poor, the uninsured, and even small businesses looking to offer affordable health care to their workers. "Small companies and their employees account for the majority of the uninsured in America," Wu says. 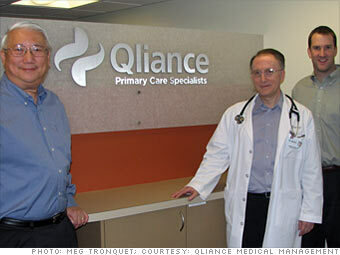 While Qliance doesn't contract with businesses directly, it has partnered with insurance brokers and third-party administrators who help uninsured employers set up Qliance's service via health reimbursement arrangements - employer-funded programs designed to reimburse medical expenses incurred by employees each month. By avoiding the overhead costs associated with insurance reimbursement, Qliance is able to keep its prices relatively low. "Instead of getting $40 to $80 per office visit, we're getting that rate monthly, a recurring revenue stream," Wu says. "We count on folks to maintain their membership over time - they can fire us at any time. So we have an incentive to keep patients happy and satisfied." The company, which will open a second clinic in Kent, Wash., later this spring, has bigger plans: It wants to expand nationally. But first, says Wu, Qliance must navigate the direct-practice laws in different states.